This particular waterfront is always very windy, so a comfy and practical outfit was a must this particular trip... You just have to embrace that crazy windswept hair! It's always refreshing to have that beautiful beach breeze and it always makes me feel happy! 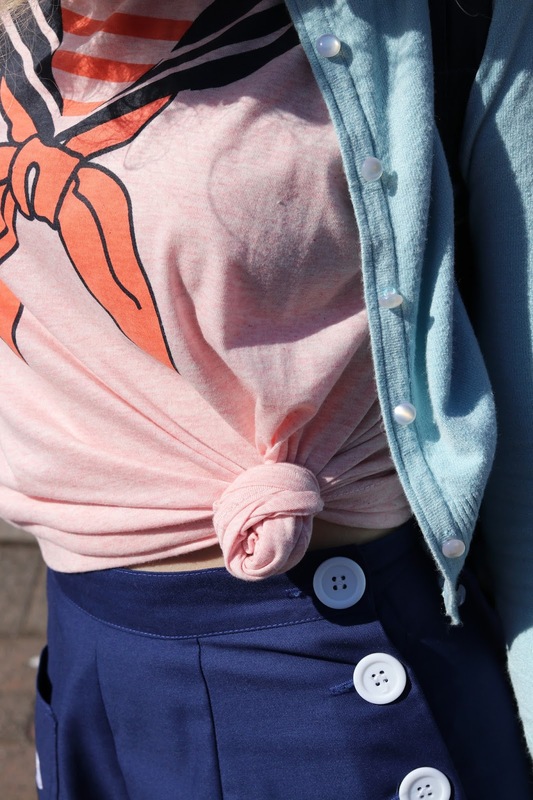 I blogged a beautiful orange dress by Joanie Clothing a couple of weeks again and I could not resist one of their adorable tshirts, naturally I chose a nautical one! I'm wearing size small and the tshirt has a relaxed fit, so it is quite roomy which makes it comfortable. I decided to knot it on the side otherwise I will probably tuck it into trousers/skirts next time. The fabric is soft, breathable and lovely to wear... I have my eye on a few more of their super cute tees! I recently picked up this super cute backpack on sale at my local shopping centre and it has become my weekend/walking/blogging bag for when I need to load my camera and lenses in. This has made a great improvement than just having to carry my camera bag on one shoulder and it's also a lot easier when walking the dogs too. This was a lovely day out by the water with Renee which ended in fish & chips before we drove home. It is meant to be hot tomorrow, I have a day off so I think I will be hitting the beach for my first swim of spring - can't wait!! !